Welcome to Part 5 of "Mattel schools DC Direct," a continuing comparison of the ways in which even an old company set in its ways can really compete for fans' dollars by stepping up to face a new challenge. When John Henry Irons was saved by Superman, he pledged to dedicate his life to making a difference. Using his knowledge of robotics, Irons crafted a suit of armor to fight for justice as Steel! This is a character who almost never existed. When they killed Superman back in 1992, DC in no way intended for him to remain dead permanently. Hell, they didn't even intend for him to remain dead as long as he did. "The Death of Superman" hit on a slow news day (much like the death of Captain America would, more than a decade later), and suddenly garnered national attention. In order to cash in on this unexpected mainstream exposure, DC delayed all the books a few months while they hastily came up with a way of extending their story. Clark was originally supposed to return to life in Adventures of Superman #500, but that issue instead kicked off the new storyline, "Reign of the Supermen." 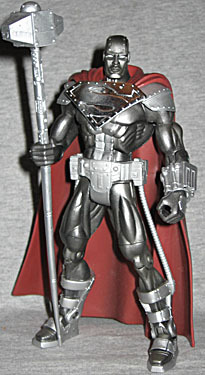 DC Direct made a whole "Reign of the Supermen" series in April of 2004, including our boy Steel. Rustin noted a whole slew of problems, and only one or two good points - one of which was the sculpt. Now, obviously the Four Horsemen didn't slack off in that department, so Mattel's Steel looks great. They're probably best known for their slightly cartoony, angular designs, which suits a man wearing thick metal armor. If anything, Steel might be too soft and rounded. This guy should be all big blocks and hard angles. He's not nearly as wide as DCD's version, but he has more depth, so he still looks massive. Looking at the face, you can tell right away that this is a guy in a helmet, not a guy with a grey head - one of DCD's major problems. Steel's head is square and chunky, with two ridges of rivets running over the top from the back of the neck to just above the eyes. His ears are covered by metal pods, and his facial features actually resemble a black man's. It's obviously John Henry Irons inside the armor, not some cherub-faced white guy. The actual "armor-y" parts of the armor are quite nice. The shoulder pads are separate pieces, and the tubes that run from his belt to his boots are actual tubes, rather than sculpted elements. The wrist bands are separate, as well, and they both rotate; the right wrist is plain, but the left has Steel's rotating rivet-launcher gun, which you can actually turn. There are riveted pads on the back of his hands, and his boots truly look like big metal shells wrapped around his lower legs. His cape is a huge improvement over DC Direct's effort: where that one was a gigantic, lifeless shell, Mattel's actually manages to look, you know, "not terrible." It's the right size and it hangs like cloth would. 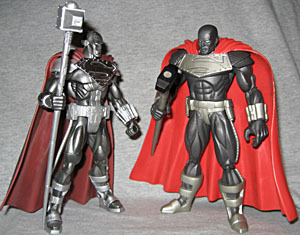 Steel's S-shield is a little bit wider than Superman's, but it's not as overdone as the DCD version. Personally, I prefer the "angular" version of the S logo that Steel wore for a while - it made him look like his own man, rather than a Super-wannabe. Oddly, the shield is raised away from Steel's chest by a piece of plastic, but the edges are still sculpted to look like they're riveted. If it's not against his chest, what's it riveted to? Did he just put them in there for looks? It's kinda crazy. One feature of the DCSH Steel that you just knew would be an improvement is the articulation. John moves at the ankles, knees, thighs, hips, waist, wrists, elbows, biceps, shoulders, torso and neck. Beautiful! The head even has a better range of motion, despite the fact that both versions have balljoints. Instead of flat grey, this Steel gets a hint of metallic shine. Though mine does have a splotch of dark paint on his head, it's no big deal. Even Steel's hammer is better. DC Direct gave us a wimpy little 5" sledgehammer, while Mattel packed in a 7" technological war hammer. That's right, it's half an inch taller than he is. The handle has the sort of tech detailing we saw on the Masters of the Universe figures, so it actually looks like something John built rather than something he bought at the Home Depot. The one area where DC Direct had the advantage over Mattel is distribution. Steel is part of the fifth series of figures, but he's shortpacked, just like Parasite. Very stupid, Mattel. This is the first series on the purple cards, and it took months for them to actually show up in stores. And even then, it took a while for anything but the useless, re-hashed Superman to appear on pegs. Mattel, you are killing this line as surely as you killed MotU and Batman. Yes, this figure schools DC Direct's in every possible way, but that doesn't mean squat if no one can find it.